Kentucky was the 15th state to join the Union. However, before becoming a state in 1792, Harrodsburg was established as the first permanent settlement in 1774. Kentucky County, Virginia was created out of Fincastle County, Virginia in 1776. Other counties were soon created and the creation of local records within the area began. The commonwealth of Kentucky has some of the richest local, county and state public records of any state in the Union. Although most have been microfilmed and are available from a variety of sources, some are still only available to the hardy researcher who is willing to venture into the dark recesses of the courthouse or archives and look for the unusual records that often bring glee to the eyes of family history researchers. Today we will look at some of the helpful records available to genealogists and discuss how to find these for our families. The youngest person in this household is Obediah G. Spencer, age two. Notice he has several brothers and sisters, which is very helpful when resolving research questions. Obediah and his older sister, Mary, are enumerated with a Kentucky birthplace. Chas., Jno., and Jessie, the next three siblings are enumerated with Tennessee birthplaces, while Wm. and Melissa are recorded with Kentucky birthplaces. This indicates that the family moved from Kentucky to Tennessee between 1847 (when Melissa was born) and 1849 (when Chas. was born.) The family moved from Tennessee to Kentucky between 1853 (when Jessie was born) and 1856 (when Mary was born.) Researcher should note and record all pertinent information from the census schedules. It is interesting to note the "p" letter appearing in the name of the father represents a double s, making his name Jessie, not Jepie. Good research practice includes handwriting a copy of this information on a blank form. This insures a closer read of the information, and a clearer understanding. Blank census forms are available on Ancestry.com. As we record this family on our chart, we note information that will be useful in our research. Providing a proper citation for information that we are recording. According to this census record, Jessie and Madalina Spencer are the likely parents of Obediah. Kentucky does have recorded birth records beginning in 1852. Called the Sutton Law, these records are not extant for every Kentucky county or year. Some counties continued to create records through 1910, after the requirement of the law had expired. The extant (available) records have been indexed with images are available on Archives.com. Below is the birth record for Obediah G. Spencer. His date of birth is 1 April 1858, and he was born in Calloway County, Kentucky. The information reported should be noted and recorded with the appropriate citation to remind us where it was found. This record indicated Obediah's father was Jesse Spencer (of Calloway County, Kentucky) and mother was Madaline Wrather (of Williamson County, Alabama). Our research should be based on answering a question. 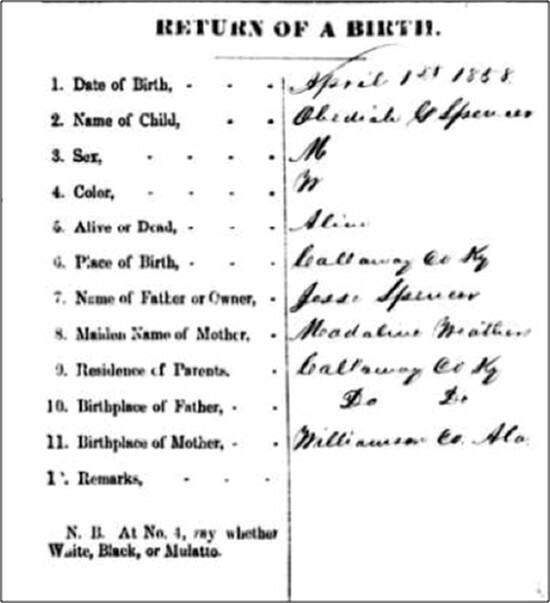 Based on the information we have collected from Obediah C. Spencer's appearance in the 1860 census of Calloway County, and his birth record, we might have new questions to research. For example, does Obediah appear in other census records? Perhaps our interest may lead to learning more about Obediah's father Jessie. We should be very clear in developing a plan for research by leading with the question we want to answer. Uniform statewide vital records for Kentucky began in 1911. Although these records are still being created, more recent years are restricted for direct family members only. 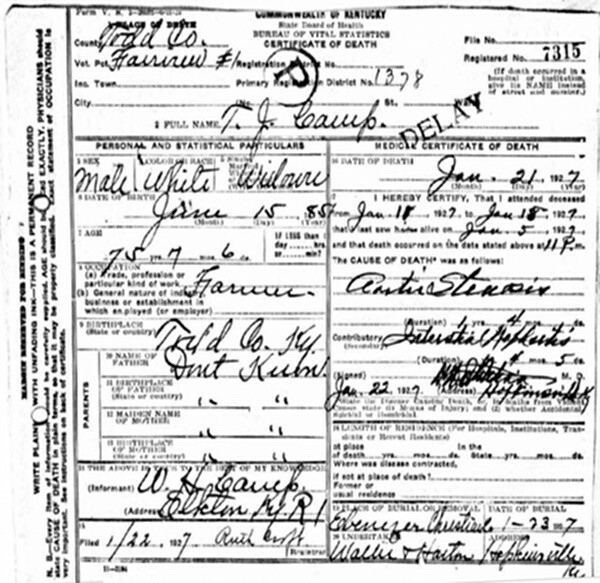 Death records including certificate images are currently available on Archives.com through 1953. There is a great deal of information found on a death certificate, but much of that evidence is given by an informant. The informant may be a member of the family with a good knowledge of the individual and surroundings or one with scant knowledge about the deceased's situation and family. We should use caution when reviewing this information. In this case, the informant did not report the name of Mr. Camp's parents. This informant, W.H. Camp, is the son of the deceased, but either did not know the parents or could not remember at this moment. The certificate does indicate the place of burial is Ebenezer in Christian County, Kentucky. As we do with all genealogical research, we work from the known to the unknown. 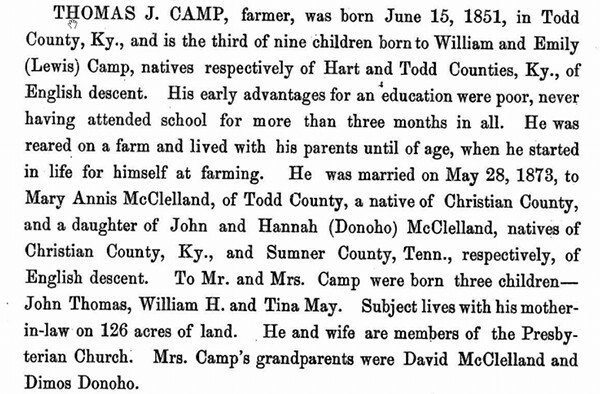 Since Mr. Camp died in Todd County, we should continue our research here, examining census records from 1920 backward noting the family, and changes with each snapshot in time. There is a wealth of other records in the county that could be considered and reviewed. Some of my favorite records for Kentucky research are the biographical sketches found in the county histories. These may be found at Ancestry.com, Google Books or as a part of the KYGenWeb project. These biographies have been compiled from a variety of historical publications. These types of books called "mug books" because they usually required payment for a better biography or photograph, still provide details and clues that may prove helpful in our research. By searching for our subject, T. J. Camp in Todd County, this sketch was found at Ancestry.com. Although we should confirm the information contained in this sketch, it contains a great deal of information missing from his death certificate. Remember that names are often more common that we might expect. Two or more people could bear the same name within the same county or area. It might be tempting to search for the name and accept all results as valid. "The Indiana Hanging. A Letter from One of the Spiritual Advisers of the Late Mr. Camp. Princeton, Nov 23, 1872. To the Editor of the Indianapolis Journal: I visited Thomas Camp, the murderer of John Riley Bilderback, as one of his spiritual advisers, several times during the last two months. Have conversed freely with him and prayed at the door of his cell. He was always ready to receive counsel and advice, and under it has often given evidence of a degree of feelling; but, like others of his advisers, I had feared that he had never fully repeated, and of course had not been forgiven. Simple arithmetic will calculate the age of Mr. Thomas Camp from Todd County, Kentucky in 1872 (the date of the article) as being twenty-one, the same age of the subject of the article. Notice the article was published in a Louisville, Kentucky paper, being a reprint of an Indianapolis, Indiana newspaper. It would be very easy to make these two young men, one man. We must be cautious with our Kentucky records. Thomas Camp of Indiana was executed as the result of a Court Case in 1872. Thomas Camp of Todd County, Kentucky died in 1927 and is buried in Ebenezer Cemetery. We work from the known to the unknown. Our research should be based on answering a question. Family information should have an appropriate citation to remind us where it was found. Understanding the county and area where our ancestors lived is important.